Video-assisted thoracic surgery, initially developed and used only in minor procedures like biopsies or athipical resections, has been extended swiftly; and nowadays it is positioned as the first option for almost all procedures, like lobectomies or even pneumonectomies. 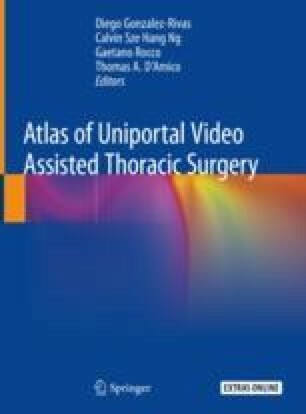 In this field uniportal video-assisted thoracic surgery represents and excellent, minimally invasive strategy, allowing us to change our anesthesic management, evolving from the current standard management, which includes general anesthesia, intubation and one-lung ventilation, to spontaneous ventilation accompanied by different regional anesthesia techniques. We achieve with this new approach to reduce our patient’s trauma and postoperative pain caused both by more aggressive surgical techniques and more invasive anesthesia approaches; without compromising efficiency. The online version of this chapter ( https://doi.org/10.1007/978-981-13-2604-2_35) contains supplementary material, which is available to authorized users.